Pioneer Woman Cookware Reviews - How Does It Work? →Pioneer Woman Cookware Reviews – How Does It Work? What Is Pioneer Woman Cookware and How Does It Work? What makes Pioneer Woman Cookware Unique? Meta: Learn the ins and outs of the Pioneer Woman Cookware line in this comprehensive review. If you’ve seen Ree Drummond’s new cookware in your local Walmart, you may be wondering if the Pioneer Woman Cookware is worth its price tag. Maybe you’ve even found yourself searching for Pioneer Woman cookware reviews. Or, perhaps you aren't aware that Ree Drummond has expanded her brand name to include a line of cookware. Whatever the case may be, today we’re going to dig deep and give you the ins and outs of Ree Drummond’s signature cookware line. We’ll cover what pieces are available, the value for their cost, and how they compare with other similar cookware on the market today. It’s important to us to provide high-quality information. We know that you’re looking to invest your money in products that will work well and offer excellent value for their cost. We scour through numerous customer reviews, testimonials, and loads of data about the products we review to bring you a thorough look at what’s beneficial and what’s terrible. More specifically, when we review products, we look for a few key criteria. We examine build-quality, durability, and customer service. We know that the best products on the market today provide all three of these criteria. Furthermore, we like to know how long a brand has been around and if it has a good reputation. While the Pioneer Woman brand offers many products for home and kitchen use, for this review we are solely focused on cookware. To further clarify, this review will only focus on pots and pans used for cooking, not on her line of bakeware. The Pioneer Woman collection of cookware includes several non-stick aluminum pans, some porcelain enameled steel pots, and cast iron pots and pans in both enameled and non-enameled varieties. Some of these pieces come in sets while others come as individual pieces. Ree Drummond has dedicated fans all over the world. Her personable writing style shows her friendly and relatable personality. She frequently connects with her readers in person through appearances at bookstores. Without a doubt, fans of hers were excited when her line of pots and pans hit Walmart shelves. But, when it comes to quality cookware, how does the Pioneer Woman brand stand up? With the amount of cooking Ree does for her family, fans should anticipate cookware that stands the tests of heavy use and time. But, are her sets worth the investment, and will they last the test of time? Pioneer Woman cookware is a collection of pots and pans sold at Walmart and on the website walmart.com. These pots and pans are relatively simple in construction and work just like any other pots and pans would work. Overall, this cookware is has a simple but effective design that is meant to accommodate a wide variety of culinary duties. One thing that separates the Pioneer Woman Cookware from other similar sets is the stunning visual appearance of each piece. Ree Drummond epitomizes the life of a loving wife and caring mother. Her family is portrayed as down to earth with old-fashioned values that call to an era past. Accordingly, each piece in her collection features a down-home warmth that speaks to days gone by. Her cookware is designed to exude a sense of old-timey family life. It can transport you and your family to days when everyone sat down together for every meal. Her non-stick pans are coated with a speckled enamel that looks remarkably like what you would see at a campsite. This same mottled enamel comes on her large enamel covered steel stock pots. In contrast to this simple enameled pattern, her enamel coated steel dutch oven shines with a brightly colored floral design. In addition to her nonstick pans and enamel coated steel pieces, the Pioneer Woman brand also features several cast iron and enameled cast iron pieces that are built to last. Many of these pieces feature her signature butterfly that has become an icon of her brand. Notable here is the bright white interior enameling found on the coated cast iron pieces. Aside from its vintage feel, the Pioneer Woman Cookware sets and pieces are unique in their color scheme. Many of her pots and pans are available in bright colors or stunning floral prints. These pots and pans will lend a brilliant touch of color to any kitchen. But, if bright colors and floral prints aren’t for you, this brand also has a handful of black and neutral options. One final note about the Pioneer Woman Cookware line is how unique the inclusion of cast iron pieces is. While cast iron pots and pans are beginning to regain popularity, there aren’t many manufacturers on the market. Additionally, it’s even less frequent to see cookware sets that include cast iron pieces, something found in more than one Pioneer Woman set. As far as cookware sets are concerned, the Pioneer Woman’s offerings are moderately priced. Of course, because they are only available through Walmart and Walmart.com, this is a well-anticipated feature. However, it is notable that Ree’s cookware undoubtedly represents one of Walmart’s more “premium” offerings. When it comes to single pieces, the price is still quite moderate. Although, it is worth noting that piecing out a full set of cookware would cost more than buying one that is prepackaged. When compared to other pieces at Walmart, these pots and pans are some of the pricier options. More critical than the base price for a piece or set of cookware is its value compared to its cost. To determine if a piece of cookware is a good value for its price, we look at the construction of the cookware and how it compares to similar pans from different brands. We also consider customer reviews to get a good understanding of how it performs over time. Many pieces in the Pioneer Woman line come in lightweight aluminum. And while these pieces present with a lovely porcelain enamel coating, some customers have noted warping early on. We can only assume this is due to how thin the cookware is and the fact that it is so lightweight. Another common complaint of the enameled aluminum cookware is an unreliable nonstick coating. Many customers have noted that despite using wooden or silicone utensils, their nonstick pans became damaged quickly. However, it is important to remember that scratches don’t always affect the overall non-stick quality. While many users love the porcelain enamel coating of these pots and pans, some have noted that it begins chipping too soon. This could be due to mishandling during the cleaning process. However, these pots and pans are supposed to be dishwasher safe. It may be that this cookware, although moderately priced, is priced too high for the value offered when considering the downsides. As far as public perception goes, it seems that many people hold the Pioneer Woman brand in high esteem. 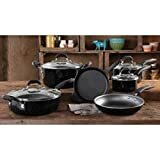 Pioneer Woman cookware reviews and testimonials for this product have shown that these pots and pans can damage quickly, many people still believe that all in all, these and other Pioneer Woman products are a great option. For the most part, many people view these pans as an attractive addition to their kitchen. This line of cookware is rated pretty much in the middle of the road which is expected for its price point. However, for some, it may be a nasty surprise to find that this cookware doesn’t hold up well over time. When it comes to the cast iron pieces offered by the Pioneer Woman brand, most are priced similarly to other cast iron pots and pans. The enameled cast iron pieces feature vintage-inspired designs similar to the nonstick aluminum pans. For users familiar with cast iron, these pots and pans perform as expected. It is worth noting that while Pioneer Woman cookware is designed in the U.S., it is produced in China. For some consumers, this fact alone makes this cookware a no, go. Many American consumers prefer to spend their money on products made in the United States. Some Pioneer Woman fans feel cheated by the fact that these pans are produced overseas. When it comes down to it, Pioneer Woman cookware reviews are kind of all over the place. Some sources report that this cookware represents a good value for its cost, many customer reviews disagree. However, it’s important to keep in mind that customers are most likely to review products and services when they are unhappy which can lead to skewed reviews. For the nonstick aluminum pieces offered by this brand, you won’t find much better quality for a similar price. 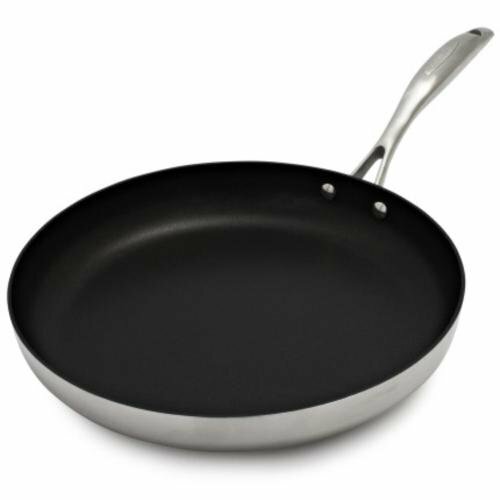 It is possible to buy higher quality nonstick pans, but they are typically much more expensive. As mentioned earlier, the cast iron pieces offered by this brand are similarly priced to other cast iron pieces on the market today. When you look at this cookware from a functional point of view, the quality of construction must be taken into consideration. While this brand is a newcomer to the market, there are many long-standing brands that provide beautiful and durable cookware. The reliable construction of brands like Le Creuset or Calphalon is without question or concern. When it comes to buying cookware, you frequently get what you pay for. 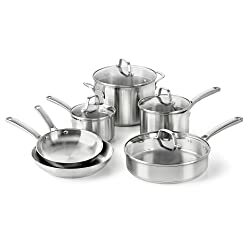 If you are looking for a low cost and reliable line of cookware, this set might be a good fit for you. However, if you want something that is guaranteed to be durable and long lasting you would do better to look elsewhere. Numerous customer reviews of this cookware show that even with proper use, this cookware may falter. However, there are also proponents of these pots and pans. Many people find that when compared to less expensive lines the Pioneer Woman line performs well and adds a touch of beauty to their homes. Compared to similar cookware such as Rachel Ray’s brand (also found at Walmart), the Pioneer Woman line holds up comparably. They are both lightweight and short-lived. Also, sets from these brands contain similar pieces at similar price points. In this category, it is hard to choose a winner, and it comes down to personal preference. As we’ve mentioned above, for durability we would recommend a higher quality line of cookware, but this line is an excellent choice for those with their budget as a primary concern. Additionally, if you are specifically searching for cookware with a vintage feel, this line will suit your needs. Also, the wide variety of pots and pans available in the Pioneer Woman cookware sets provides a lot of versatility for a relatively low cost. These sets can make excellent housewarming gifts or gifts for graduates leaving home for the first time. Because the Pioneer Woman cookware collection is sold exclusively through Walmart, you can expect to pay a relatively low price from the get-go. However, if you keep watch on seasonal sales, you can sometimes grab these cookware sets for an even better bargain. Additionally, you can occasionally find these pots and pans in the clearance sections of both brick and mortar Walmart stores and online. Bottom line, you could do better, but you could also do worse. If you find yourself in need of cookware quickly, the Pioneer Woman cookware is readily available at Walmart stores nationwide, and it will be useful at least for a short period of time.